At the end of the 2012 NFL season, Steven Jackson and the St. Louis Rams decided to part ways. The Rams needed to rebuild the roster, essentially starting from scratch, while Steven—now entering the later stage of his career—wanted to contend for a title. Despite how difficult it was to leave St. Louis, No. 39 and the franchise that had drafted him agreed it was for the best. The Rams, at Steven’s request, released him from the final year of his contract, making him a free agent on the open market for the first time in his career. Steven said that he had carried the utmost respect for the Falcons organization, and the way they had built a team to contend for a championship. Reality, however, proved far different for No. 39 playing for the Falcons. He would play only two seasons for the franchise, and both were fraught with difficulties that he never anticipated before signing there. Teams don’t go 4-12 because one player fails. Teams go 4-12 when almost everybody fails. It’s natural to wonder what an NFL running back has left after 10 seasons and at the age of 31, but it’s not fair to judge Jackson on last season, when he rushed for a career-low 543 yards and 3.5 per carry (his previous career average: 4.2). He was injured in Week 2, ironically against St. Louis, and ran behind one of the NFL’s worst offensive lines. 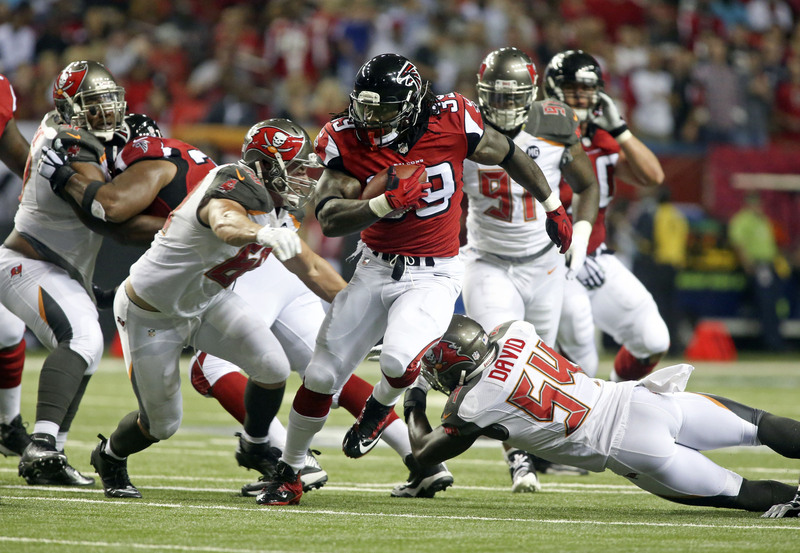 Injuries to wide receivers Julio Jones and Roddy White further limited the offense. When Steven returned for his second season as a Falcon, he was optimistic. Players were healthy again, and the team seemed hungry to show that the previous year had been a fluke. But after winning two of its first three games, Atlanta began to freefall once again, losing the next six contests. They finished the year 6-10. Head coach Mike Smith was fired, and when Dan Quinn was hired from Seattle to replace him, the team informed SJ39 that the new regime would be moving on without him. Now that the Atlanta Falcons and I have parted ways, I want to say thank you to the organization, and the entire city of Atlanta. In terms of what we hoped to accomplish as a team on the field, my time as a Falcon was a disappointment, but I will always be grateful for how the city and franchise treated me while I was there. Mr. Blank is one of the classiest owners I’ve been lucky enough to meet, and I feel fortunate to have played for him. I was also fortunate enough to make some tremendous new friends while I was there, and I’ll continue to be a big brother to everyone I shared the backfield with. I wish the Falcons nothing but the best moving ahead.